In the Fortress of Buhen reconstruction (see an early rendering at the left; hover over to enlarge), Bill Riseman and Donald H. Sanders pushed the limits of computer technology in the service of education and archaeological research, synthesizing all the techniques he had been exploring while producing the models of Giza, Jebel Barkal, Nuri, and Meroe, into a single complex and very large reconstructed ancient environment. In 1994, in order to appreciate fully the capabilities of advanced computer graphics methods for simulating ancient worlds, the data in the comprehensive model was exported, as a test, into a computer system capable of immersive virtual reality--one of the earliest examples of what would eventually blossom into an entirely new discipline, called virtual heritage. The reconstructed virtual archaeological site demonstrated a multilevel enrichment of the sensory experience of ancient monuments. Extrapolation of the technologies then at our disposal allowed us to envision that virtual travelers may be able to access interactive visual and text databases and even visit other virtual sites all from within the experience of the original virtual environment (we now take these imaginings as given expectations of newly created virtual worlds, such as those now routinely created by LEARNING SITES, among other virtual heritage practioners). During 1994, we next formulated and began to implement new and revolutionary ways to change dramatically the way cultural information around the world could be shared, experiences, and thus to profoundly change the methods of education and scholarship. For this transitional stage in our testing process (from the use of renderings, animations, and photo-compositing techniques to the implementation of virtual reality), we chose the ancient Fortress of Buhen (fully elaborated during the Middle Kingdom, 12th-Dynasty rule of Sesostris III, c.1878-1843 BCE; a river view from an early model at the left; hover over image to enlarge), located at the head of the Nile River's second cataracts near the ancient Nubian-Egyptian border. The Fortress of Buhen seemed an attractive site for testing the integration of advanced computer-graphics techniques, virtual reality, and the newly emerging information superhighway because: (1) its remains are extensive and well documented; (2) the structures are no longer available for on-site investigations or first-hand visits; and (3) the site has a long and fascinating ancient multicultural history dependent on economic and social cooperation that seemed to resonate with contemporary late 20th-century news stories. The Fortress at Buhen (see the detail river view rendering at the left from the early virtual world; hover over to enlarge) extended along the west bank of the Nile River for over 150m and incorporated the latest defensive technology that even Medieval military engineers would have envied: moats carved 3m deep into bedrock, revetments, drawbridges, bastions, buttresses, ramparts, battlements, embrasures, loopholes, and catapult stations. The military compound covered about 1.3 hectares and encompassed administration buildings, storehouses, and entire settlements. The Egyptians seemed to have occupied the inner city in a separate enclave bounded by the walls of the inner fortification, while mercenaries seemed to have lived just within the perimeter of the outer fortification walls. The military complex probably served as a customs and naval depot. Buhen was the northernmost outpost in a series of at least eight brick and stone fortifications constructed during the 12th Dynasty along a 60km stretch southward from the second cataract. Each fortress was in visual contact with the immediately adjacent forts, which included the sites of Mirgissa, Shalfak, Uronarti, Askut, Dabenarti, and ending with the paired fortresses of Semna and Kumma, located on opposite sides of the Nile River from each other, marking a gateway into Egypt. The purpose of this series of forts may have been to protect trade goods coming into Egypt by water from Nubia and southern Africa, safeguard the southern border, and restrict river traffic from the south. 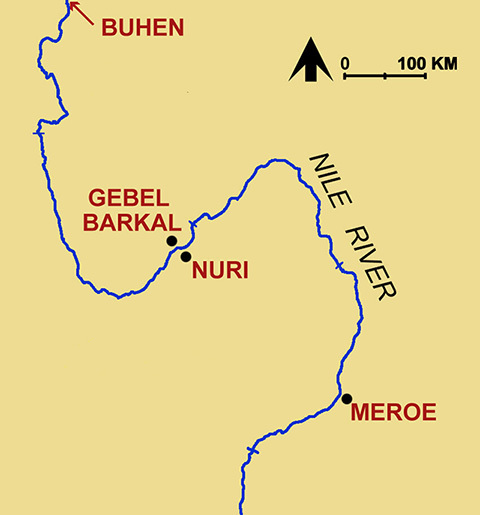 Since the cataracts (rapids) were rendered impassable during the Nile's low water, the vessels had to be off-loaded and their goods protected from attack. Buhen's gateways show evidence of fire dated around 1675 BCE, the period of the Hyksos occupation of Egypt, but the traces of burning and the damage could equally well have been accidental or an indication of localize attack. Contemporary with the Hyksos were the (so-called) Pan Grave People, a warrior group probably from Lower Nubia, who were possibly brought into the region as soldiers by the Egyptian Theban rulers of the 17th Dynasty, perhaps as a countermeasure against the Hyksos threat. It appears that throughout its life, the fortress remained nearly impregnable, despite numerous violent governmental changes. The basically defensive nature of the complex emphasized the mutual economic interdependence between Egypt and Nubia. It has been postulated that during periods of political instability, as during the Hyksos period, Egyptians stationed at the border forts had to put in long terms of military duty, to the point where the Egyptians became integrated into local Nubian culture, as indicated by evidence in contemporary graves. Thus, over a period of nearly 2000 years, the fortifications (seen in an early rendering at the left; hover over to enlarge) seem to have been occupied by a succession of different cultures (Egyptians, Kushites, and the Meroitic peoples) without the need for major reconstruction. The erection of the Aswan High Dam in 1964 has fully submerged Buhen, and all the other monuments along this stretch of the Nile River, under Lake Nasser. Using the techniques we had tested on evidence from Giza, Jebel Barkal, Meroe, and Nuri, Riseman built a 3-dimensional vector model with associated texture maps of the fortifications of Buhen (including a simulation of the interior decoration of some spaces and the actual size and type of stone blocks and mudbrick coursing). This was a revolutionary concept and model for its time. The individual still images of the Buhen model were generated on an Intel 486-66DX2-based PC ! The Buhen data were then loaded onto a Kubota-Denali computer via a TCP/IP network (no USB drives back then). The Kubota-Denali was a virtual reality-capable computer that competed with high-end Silicon Graphics systems. Along with the Kubota computer, we utilized Leep's CyberFace 3 (a beam-mounted VR headset display used for interactive total immersion) and Sense8's WorldToolKit software (all artfully assembled and integrated for us by Eben Gay) to create a real-time near first-person experience. Subsequently, the Buhen virtual environment data were transposed from the Kubota system to a comparable Evans & Sutherland Freedom 3000 image accelerator with a Sun SPARCstation serving as host, supplied to us by Evans & Sutherland. The virtual world was widely demonstrated throughout 1994 (including at Siggraph, Orlando, Florida). The virtual tour of ancient Buhen began aboard the fully rendered ship of state of the pharaoh docked at quayside. Virtual visitors could experience the scale and beauty of the Egyptian vessel and accompanying cargo ships. Visitors were then led from the ship onto the dock toward and onto the outer fortification walls and 'flown' around the exterior walls (covering several kilometers in just a few moments), then led through the main gate to explore various rooms of the inner city, all the while getting a sense of the immensity of the spaces and the detail of the decorations and building techniques. We constructed the tour of Buhen so that virtual visitors are led by a virtual tour guide in the guise of an ancient Egyptian scribe, a computer-generated mannequin who moves through the fortification along a preset path. The virtual visitor always has the ability to look around in all directions, travel along any other pathway, or choose to follow the instructor. As the mannequin-scribe-instructor moves through the fortress, at predetermined locations, an innovative and first-of-its kind, 3-dimensional, interactive reference kiosk was programmed to appear. The Left Panel of the kiosk in the Buhen virtual world contained a plan of the fortress indicating where the visitor is standing and in what direction the visitor is looking (including a 'you are here' locator). This panel was to become a fully interactive geographic information system (GIS)database of site-specific and regional geographic, topographic, and locational images and data. The Central Panel contained an excavation photograph illustrating the actual conditions of the fortress at the spot at which the visitor is viewing. The image allows the viewer to compare the reconstruction to the archaeological evidence. This panel was to become a fully interactive visual database of all archaeological images relevant to that particular spot in the virtual ancient environment. We had originally planned to link each data panel in the kiosk to each of the others for cross-referencing, as well as to connect to the expanding international network of digital archaeological libraries being developed across the Internet. Users of the virtual ancient environment would have been able to see Buhen, or other sites, at any time throughout its history, at various moments during its excavation, or be able to move into related virtual worlds via information presented in the kiosks. Intelligent search filters and image-access protocols had not been built, but would have been (and still are) necessary to retrieve data successfully and efficiently as the virtual traveler explores the various levels of information available at any one time. Much of the research on relevant thesaurus interfaces wes already underway by 1994 (some by us). Imagebase structuring and navigation procedures were just beginning to developed. Since the Buhen virtual world was designed as a prototype, many of the more advanced features of the virtual environment had not been completed. Since its founding in 1996, LEARNING SITES has continued to incorporate similar enhancements to each virtual world in order to provide supplemental educational and research opportunities (for example, interactive Java-enhanced databases, intelligent tourguides, time sliders, and worlds linked to supporting images and explanatory text). 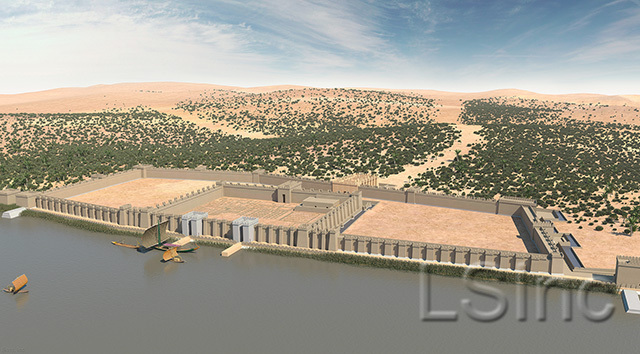 By 2011, LEARNING SITES had come full circle and implemented a virtual tour guide and interactive tourbook into our Northwest Palace at Nimrud virtual world. 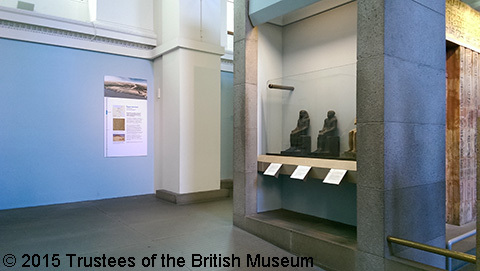 Further, the Buhen 3D model has been updated several time (most recently in 2015, for the British Museum; see poster in the image below, left; hover over image to enlarge). In our Early History discourse, we outlined several examples of what is happening to evidence of our cultural heritage--sites are literally disappearing (this text was originally written long before current destruction of heritage sites due to deliberate dynamiting, wars, climate change, and overdevelopment) and the visual documentation of those sites is also vanishing. We believe that through judicious use of current and emerging technologies, we can record and digitally preserve evidence of our shared past not just in two dimensions but in full and accurate (interactive) three dimensions, for the enjoyment, evaluation, and education of present and future generations. When archaeologists were recording their finds they could have had no idea what the future had in store for their photographs, drawings, and field diaries. Currently, only a small portion of these original excavation documents has ever been published. In many ways, the ones that have never been published are the most important, because the published evidence represents only the final stages of excavation. The unpublished material (especially the progress photographs and daily notes that hold the keys to evidence necessary for accurately reconstructing ancient sites) have been sitting in museum storage, university archives, or scholars' basements, sometimes for decades. The images and texts are deteriorating, taking with them irreplaceable information. Computer technologies can assist in reuniting the objects and features from disparate locations (across museums, across a site, or across time) into a single 3D model. The results recreate the experience of ancient worlds in their original complexity. That model does not have to be our interpretation. Anyone can then have access to the data to reassemble and test any number and kind of hypotheses. Such capabilities have never been available to so many people. Archaeologists,teachers, museum professionals, and students can all benefit from exposure and access to the full range of primary excavation data. We believe that current digital technologies can eventually overcome existing impediments to learning and enhance and stimulate the freer and more complete exchange of ideas, facts, and visualizations. We believe this can all come about following the development of new multi-directional databases into which excavated data could be fed, existing and emerging digital libraries could be linked, and from which new hypotheses could be tested and new computer environments constructed. All the while, these same databases could be continually updated and revised with new incoming data as they becomes available directly from the field or from newly input items from museum storage or university archives. The virtual-world builders could refine their models as soon as new research became available, electronic texts for the classroom would have the most up-to-date information, and courses at all levels would have access to the latest material and interpretations. Badawy, A. 1966. A History of Egyptian Architecture.Berkeley: University of California Press. Edwards, I. E. S., et al. 1973. The Cambridge Ancient History. Volume II, 3rd edn. Cambridge: Cambridge University Press. Emery, W. B.; H. S. Smith; A. Millard, et al. 1979. The Forty-Ninth Excavation Memoir. The Fortress of Buhen: the archaeological report. London: Egypt Exploration Society.